Sailors Edge stitch and Sailors Stitch are similar. 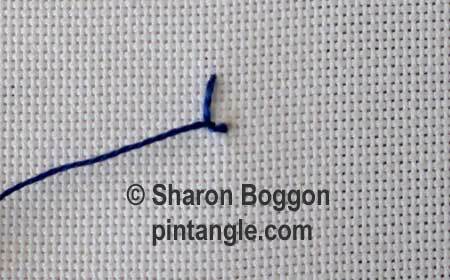 I think Sailors Edge Stitch is a variety of Sailors stitch as the main hand motions required to make the stitch are the same. They are a good example of how if you change one hand movement in the process it can totally change the look and usage of a stitch. I found this version in The Batsford Encyclopedia of Embroidery Stitches by Ann Butler. Work is stitch down a vertical line from top to bottom. Have your needle emerge at the top-of-the-line. Move it down the line and take a small bite of the fabric as illustrated. 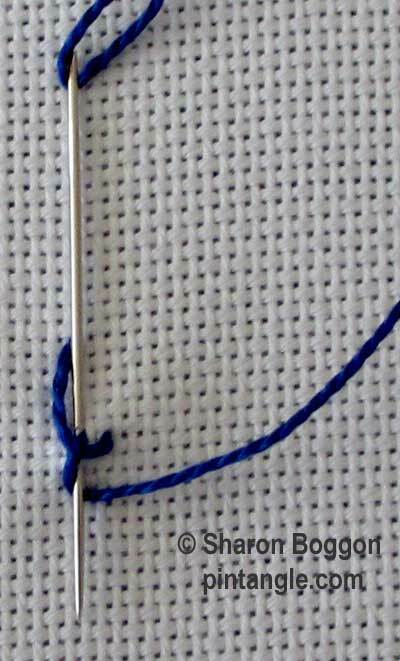 With your needle pointing left keep the thread under the needle tip pull the needle through so you have a small buttonhole stitch. 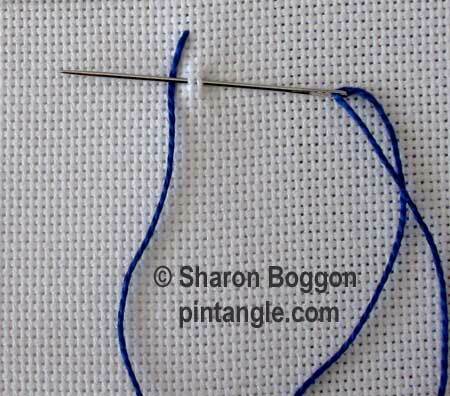 Insert your needle at the base of the buttonhole stitch with the needle tip emerging at the other side of the buttonhole as illustrated. 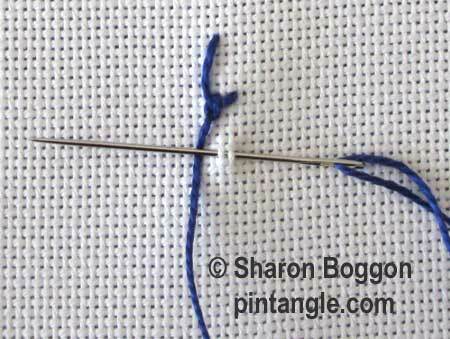 Wrap your thread under the needle as you would a chain stitch and pull the needle through. Continue down the line in this manner. As you work hold each loop on to the fabric with your left thumb (if you are right handed) until the little chain stitch anchors it. As you can see it is quite easy to work and as a result it is a quick edging stitch. If you vary the tension of the thread between each buttonhole you will produce a looped edge. Sharon , everything on your website is superb….I LOOOOOOOVE IT! Hello, and thank you for this sweet sea wave stitch. I needed one more motif to go with a collection of Greek themed / sea faring stitches to add to the collars on a few packs of newborn onesies for my new grandson to be born in May. His father’s family are Greek and I’m hoping it will be a fun blessing. This stitch caught my eye because of the name of it. My husband was a sailor in the US Navy, 1969-1973. This stitch looks like little waves to me. Thank you for sharing all of your stitching with us.